Tomorrow it’ll be known if Metro has met their monthly punctuality target for the first time. As-of yesterday the daily update on the Metro web site was sitting on 88.7% (last updated 28/9), clear of the 88% cut-off. (That’s 88% of trains less than 5 minutes late.) For the first time in many moons, you may not be able to claim a freebie compensation ticket. New train timetables start on the 10th of October. One of the notable changes is Laverton to City (via Altona) trains starting, making use of the new third platform at Laverton. There’s only a couple of trains in each direction initially, but as more get implemented, it should make a big difference to Werribee people, who will have a faster, less crowded ride — and Altona people, who will have a better chance of getting a seat. There’s also some extra services on the Sydenham line. The other significant change is a boost to off-peak services on my line, the Frankston line. Most of the improvement is weekdays during the day (buzzword: “interpeak”), with trains to run every 10 minutes. Weekday evening services will also go from every 30 minutes to every 20, up until 10:15pm outbound (and curiously, 11pm inbound). And both the changes are likely to help spread the peak-hour load by encouraging more people to travel outside rush hour, knowing they don’t face a long wait. That’s how it benefits peak-hour commuters. So it’s definitely a step in the right direction. And hopefully a another step towards providing frequent 10 minute services on every line, seven days-a-week… though at the current rate, it will take decades to do every line. As I’ve noted before, the move to 10 minute services is compelling. It’s so frequent that you don’t really need to look at the timetable — which means it works (at least in one direction) with Melbourne’s non-coordinated feeder bus services. If you do bother to look at the timetable, it’s (mostly) memorable. If a train is cancelled (and the likelihood is currently 0.8%), there’s barely enough time to walk back to the carpark (if you are in the minority and have driven to the station), let alone walk home, before the next one comes. Which is just like a real Metro. More services will definitely get more people off the roads and travelling by trains. But of course, there are some niggly little issues. The first issue is that, like the ten minute services launched on the Werribee line last year, every second train runs direct to Flinders Street. This isn’t a bad thing per se, since Flinders Street is the City’s busiest station, and close to a lot of city attractions, and these trains are in fact through-routed to Werribee, so they will also stop at Southern Cross. But the inconsistency is likely to cause some confusion, and it means Frankston trains will only operate through the loop every 20 minutes. In many cases Loop to Frankston passengers will do better to catch the first train they see out of the Loop and then change at Richmond or Caulfield, but I wonder how many will realise and do so. This appears to be the next step in a longer-term plan to run more (eventually all) Frankston trains via Flinders Street and Southern Cross only. 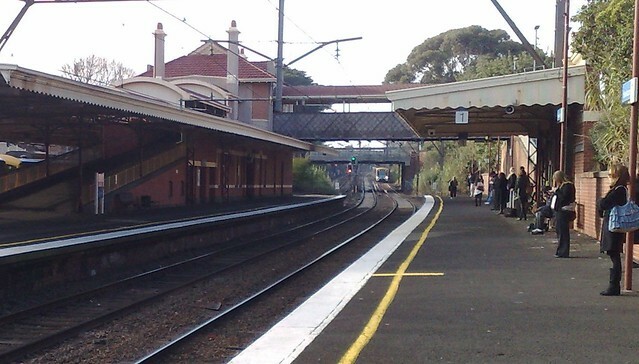 The Dandenong and Frankston lines operate in tandem. For instance together they provide a 10 minute service as far as Caulfield on weekends, and a 15 minute service in the evenings. This new change throws that out a little. 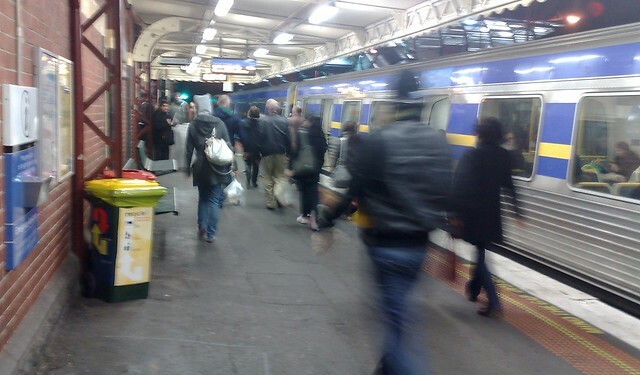 City, Richmond, South Yarra and Malvern — off-peak weekdays — currently 8 trains per hour; a train every 7-8 minutes. This will now become 10 trains per hour, with gaps of up to 10 minutes. Probably not a huge concern, given only a marginal increase in the maximum interval. City to Caulfield — weekday evenings — currently a train every 15 minutes. This will now become 5 trains per hour, but with gaps of up to 20 minutes (and other gaps of only 5 minutes). City Loop (Caulfield loop) — weekday off-peak — currently 8 trains per hour, relatively evenly spaced. This will become 7 trains per hour, with gaps of up to 15 minutes, but as close as 2 minutes. Arguably not a huge issue given few people use the Loop for intra-CBD travel anyway, and the Burnley tunnel closely mimicks the weekday Caulfield loop tunnel, but the short intervals may cause delays. See the Human Transit blog: The perils of succeeding “on average” for an interesting post on the problems of inconsistent frequencies. The old timetable had Dandenong and Frankston trains pretty well isolated from the rest of the network, apart from Gippsland V/Line trains. Running every second Frankston train through to Werribee means that there now is a connection between the Caulfield group and the Northern group (Werribee, Williamstown, Sydenham, Craigieburn, Upfield) as well as V/Line services to Geelong, Ballarat, Bendigo and Seymour. It remains to be seen whether this will be a problem (it’s already like this to a certain extent in peak hours), but there may be cases where a broken-down train on the Sydenham line may now indirectly cause delays on the Frankston and Dandenong lines. Metro will have to take the utmost care to ensure flow-on delays are kept to a minimum. Perhaps the biggest issue is that the 10 minute services only run interpeak on weekdays. This in fact means services from some stations (including Bentleigh) will be more frequent than during the peak-shoulder period (essentially because so many express trains bypass most of the zone 1 stations). And of course on the weekends (every 20 minutes) and evenings (every 20-30 minutes), when there are lots and lots of cars on the road, that frequent service doesn’t yet exist… let alone on all the other lines, and on connecting bus and tram services for all the people who don’t live near stations. Niggles aside, this is a positive move. Hopefully with further changes over the next couple of years, these issues will be fixed, and the push for frequent all-day services will continue. Next → Next post: What ever happened to…? Will the Craigieburn line(My Line) which is the 2nd busiest line run every 10 minutes? Was reading in the paper a few months ago that, apparently, the Frankston trains (back in the dim dark 1940s-1950s) used to run straight through to Williamstown. Would be good if they ran a shuttle-type service in off-peak between Westall and Flinders St (say 2 or 3 per hour) to take the load off the usual service as even in off-peak it’s sometimes standing room only on trains. I like how Metro are doing things. Change a few things; see how it goes, then tweak/change some more, and keep doing it. Not getting stuck on “this is how it’s always been done”. Slowly enough commuters can adapt, but quickly enough change is happening. The problem with the frankston line is now the extended time it takes to get to the city because the trains stop everywhere. A faster service is just as likely to increase patronage, than a 10 minute (take forever) frequency. Why not have every second train not only direct to Flinders street but express Caulfield to Richmond? And while I’m on the subject, there is plenty of time for the morning peak hour expresses trains to stop at Bentleigh & still overtake the stoppers. I dunno about other people, but I find the sort of scheme where there is 5 trains an hour but very unevenly spaced, very annoying.